Note: On todays “chipper” athletes will use the same barbell, and remove weight accordingly for each exercise. Large classes will complete the Pull-up at Krav Maga. This is a burner! Efrain is Athlete Of The Week! 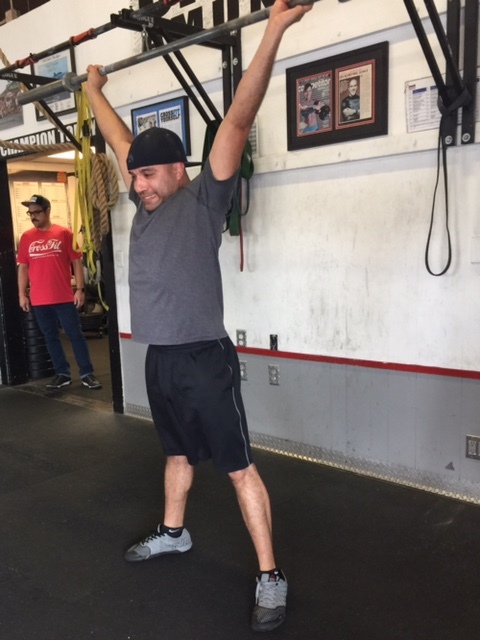 Congratulations to Efrain who was recognized as Athlete Of The Week at both CrossFit Amundson and Krav Maga Santa Cruz. Efrain was one of the first 30 Athletes to join our gym in 2012, and has never looked back. A former football player, Efrain started his training with a solid foundation in weightlifting, but was initially challenged by the more complex Olympic lifting skills and gymnastics. However, his diligent commitment to practice paid off within just a few months, and the results ever since have been awesome to behold. At Krav Maga, Efrain’s technique is crisp and efficient, in addition to his endurance and stamina on the extended combative drills. Best part about this humble warrior is his kindness, encouragement of others, and kind spirit. Keep up the great work Efrian!